Rank and organization: Captain, U.S. Air Force, 21st. Tactical Air Support Squadron, Nha Trang AFB, RVN. Place and date: Near Dalat, Republic of Vietnam, 24 February 1967.
were pinned down by devastating fire. Capt. Wilbanks recognized that close support aircraft could not arrive in time to enable the rangers to withstand the advancing enemy, onslaught. With full knowledge of the limitations of his unarmed, unarmored, light reconnaissance aircraft, and the great danger imposed by the enemy’s vast firepower, he unhesitatingly assumed a covering, close support role. Flying through a hail of withering fire at treetop level, Capt. Wilbanks passed directly over the advancing enemy and inflicted many casualties by firing his rifle out of the side window of his aircraft. Despite increasingly intense antiaircraft fire, Capt. Wilbanks continued to completely disregard his own safety and made repeated low passes over the enemy to divert their fire away from the rangers. His daring tactics successfully interrupted the enemy advance, allowing the rangers to withdraw to safety from their perilous position. During his final courageous attack to protect the withdrawing forces, Capt. Wilbanks was mortally wounded and his bullet-riddled aircraft crashed between the opposing forces. Capt. Wilbanks’ magnificent action saved numerous friendly personnel from certain injury or death. 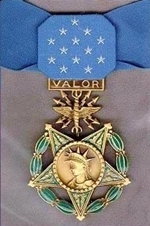 His unparalleled concern for his fellow man and his extraordinary heroism were in the highest traditions of the military service, and have reflected great credit upon himself and the U.S. Air Force.